Becoming Vegan did not let me forget the good taste of pulled pork or Bacon. The most unhealthy things one can possibly eat, yet i have to admit when someone fries Bacon Sunday mornings, my mouth is watering as well. Anyhow most important while being on a vegan diet is to take your time and research, to create a good alternative. This is so essential to stick to your decision and avoid cravings. 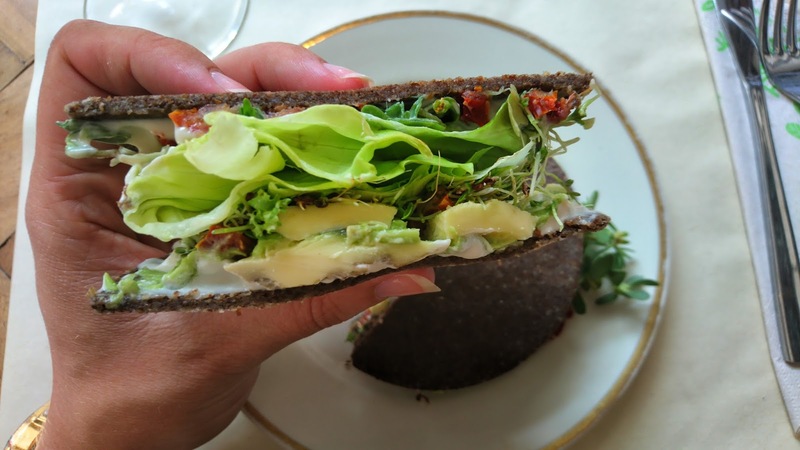 Replace good food with something even better, that is healthy and proper tasty. The best example for this is Pulled Jackfruit. I had never heard of it until i came across some healthy vegan channels and literally i've been running around town for 2 weeks until i finally found it. In Europe you can mostly find Jackfruit canned, be careful not to take the one with sirup. A lot of asian shops offer it. 1. 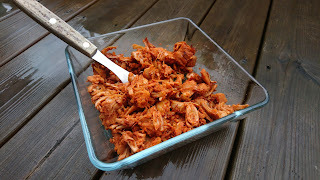 Rinse your Jackfruit and pull apart with your Hands and a Fork, put into a Bowl. 2. Dissolve your vegetable stew in cooking water and add into the Bowl. 3. Add all other ingredients to marinate the Jackfruit. Best press your Garlic fresh. 4. Let the mass rest overnight, so it soaks really up the spices. 6. Heat up your oven to 170°c and bake in a form for around 1h until the texture gets a bit crispy. 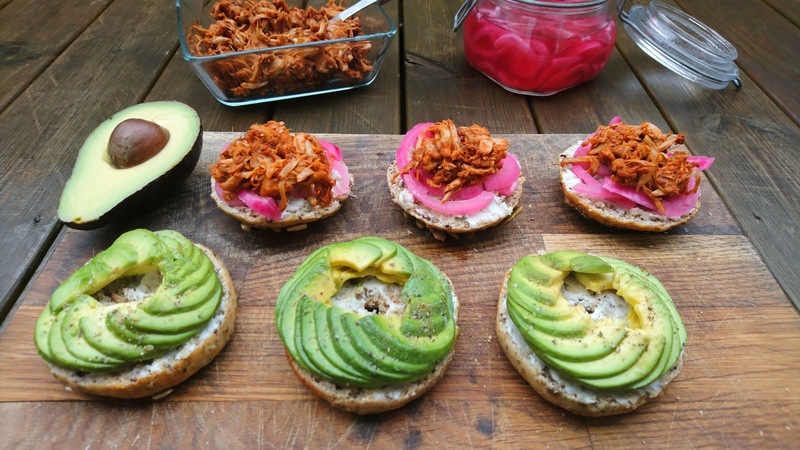 Serve with Avocado on homebaked Bagels. 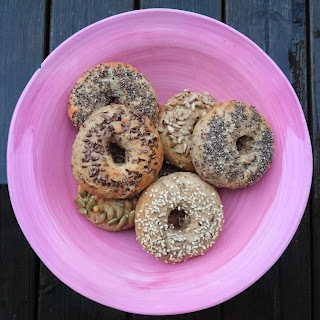 I've been searching for a long time to find a satisfying Bagel recipe, ending up with my own, taking the best ingredients out of all. What i could see was, that in every recipe there was added sugar to the dough somehow, whether with honey, sugar or maple sirup. 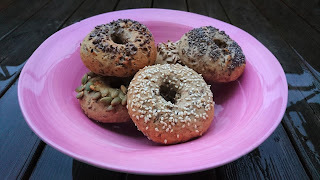 I don't like sweet bread and insisted on having my Bagels as sugarfree as possible. 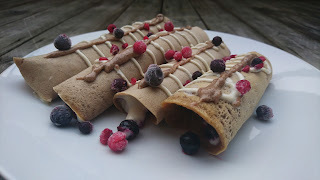 I avoid also using wheat flour, while for many recipes it is indeed neccessary to have some type of white flour. 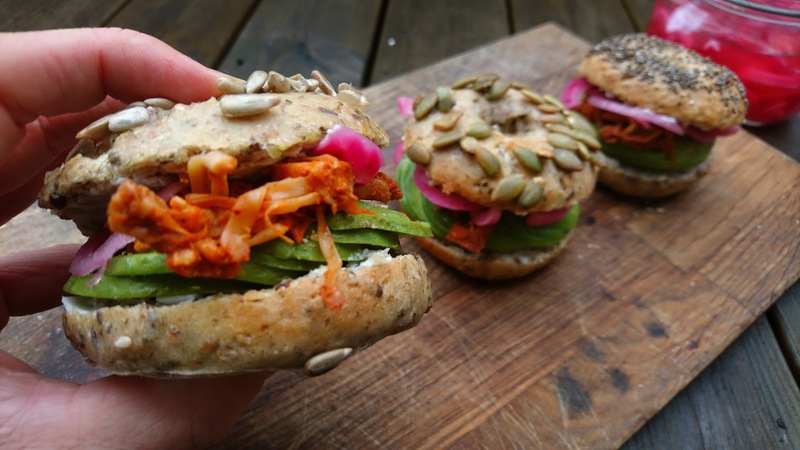 So below alternative Bagels are vegan, refined sugar and wheat-free. 1. Fill a bowl with the warm water and add your dry Yeast. Let it rest for around 10min so it activates. 2. Meanwhile add your dry ingredients (except for the Topping Seeds) into a big Bowl and mix well. 4. 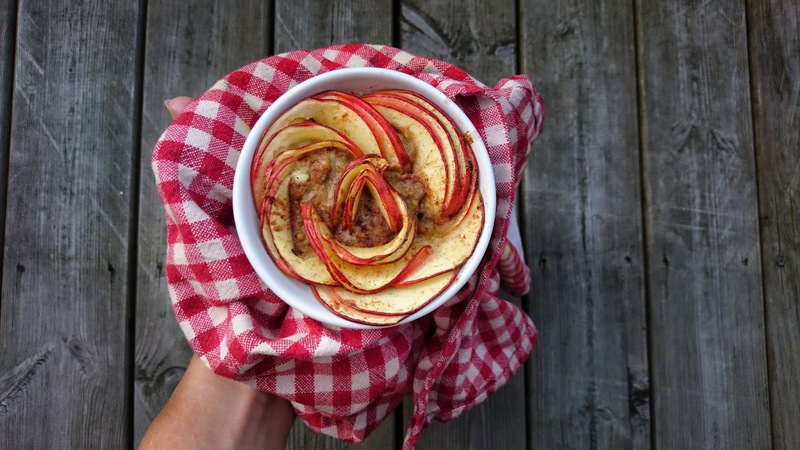 Cover your Bowl with plastic foil and place it in a warm area. Let the dough rise for at least 1h, best is 2-3h. 5. Heat up Water with a bit of Salt in a big pot. 6. Take your dough and seperate into 9 Balls. Press them flat and add the hole in the middle. 7. When your water is cooking, add the Bagels one by one and cook until they come to the top. 9. 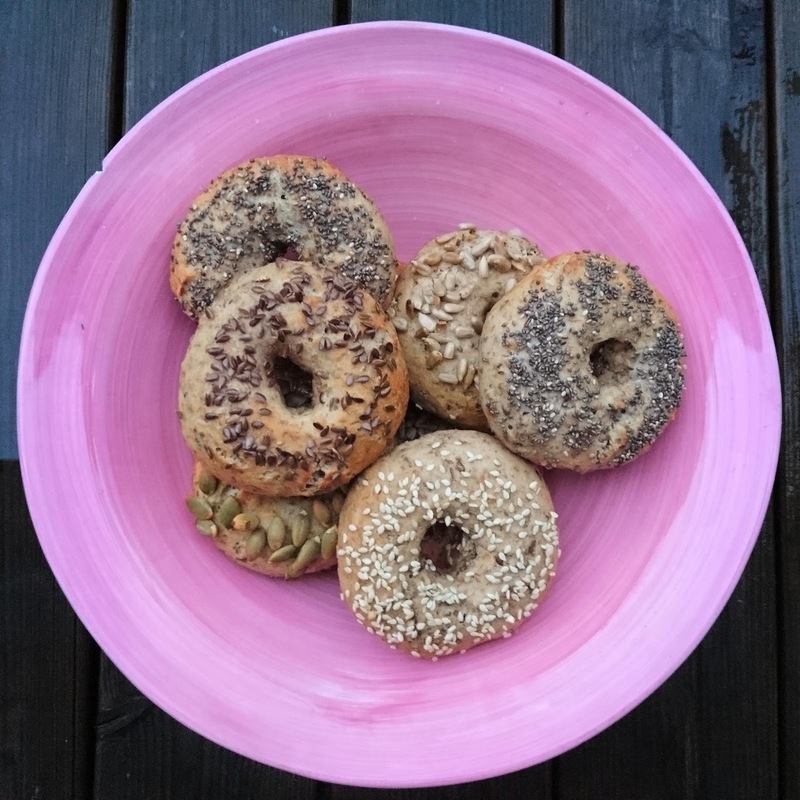 Take your wet Bagels and place on a Baking sheet on a baking tray. 10. Decorate with Seed and bake in the Oven between 15-20min until they are gold-brown. An apple a day keeps the doctor away. Apple Pie in the morning will remove all your sorrow from last evening. The problem with cakes is usually, that they are quite big. So either you share or you eat it all up on your own. If you know the struggle, here's this little cake, which is adapted to the single household. 5. Bake in the oven for around 30min or until the Top turns Crispy. The consistence of the cake below will have a fluffy Oatmeal consistence. If you like it more firm, add more flour. Very shortly before my upcoming Trip to Paris, i decided that i need to taste one typical french dish: Crêpes. My mother and brother do really love them. Since i am allergic to milk and egg, i have never had the delight to actually taste them before. 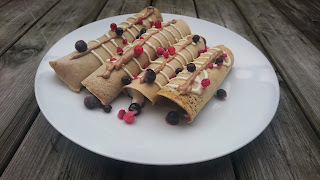 Luckily i found a recipe by simplyconny, which i used as inspiration for my coffee-kicking crêpes. 2. Melt your coconut oil and add it with your Milk to the mixture. 3. Stirr the dough well and let it rest for 5min, the texture will be liquid, so easy to pour in the pan. 4. Heat up your pan, with a bit of coconut oil. Test if it's hot by letting a drop of water in. When the water condenses, the pan has a good heat. 5. Now pour your dough and spread quickly by moving the pan in circles, let bake on one side, until the edge turns crispy and turn over to the other side. 6. Serve with Soy Joghurt and Frozen Berries. I topped the crêpes with homemade Almond Butter as well. 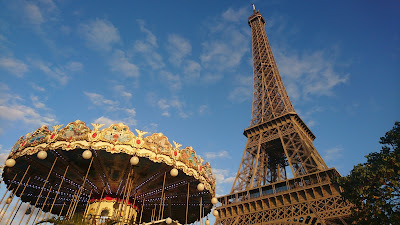 I've been to quite a few big cities in Europe and always thought nothing could ever match with Paris. When i finally came to Rome, this city took my breath. Mainly because of the atmosphere and the old buildings. I really love cities with characters. While New York was for me extremely modern and cold, Rome suprised me with it's ancient flair. 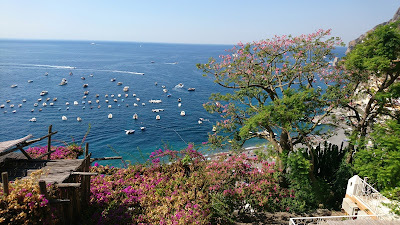 There is so much to see, around almost any corner you will find something new and beautiful. Wether it is some ancient roman ruins or another church, this city will give you endless opportunities to explore. 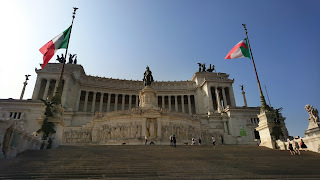 You can get very cheap flights to Rome Fiumicino Airport, i paid 100euros both ways. From the airport there is a train that will take you within 45min to Roma Termini, the Central Station. I stayed at Alessandro Downtown Hostel, which is only a 5min walk from the Train Station. If you need to get to the airport or continue your journey, this is very practical. I booked a bed in a 6-female dorm, which was very spacious, clean and luckily i shared it with only 1 girl the first night. The bathroom facilities are in the hallway, there are seperate shower and toilet cabins. 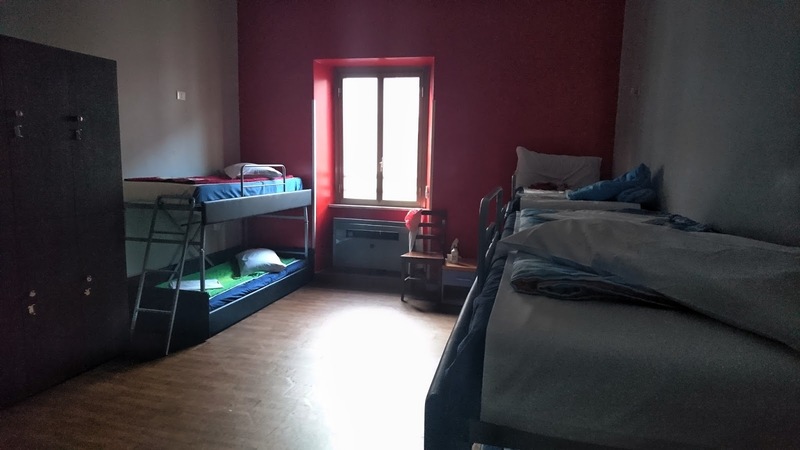 It's less luxurious, but fairly cheap for staying in Rome. The price per night was around 31€ including city tax. 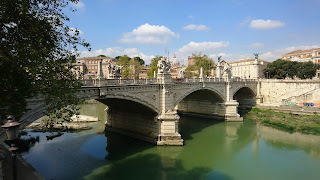 Walking: Although Rome is a quite big city, everything is fairly reachable, if you are young and like walking. Also you can see so much more and will maybe find some unique spots eventually, while getting lost in the maze of the city. Public Transport: Rome has very good public transport connections, whether by Bus or Metro, everything is quite close. I have actually taken the Bus one day, since it was raining cats and dogs. I can not say anthing about the Metro though. 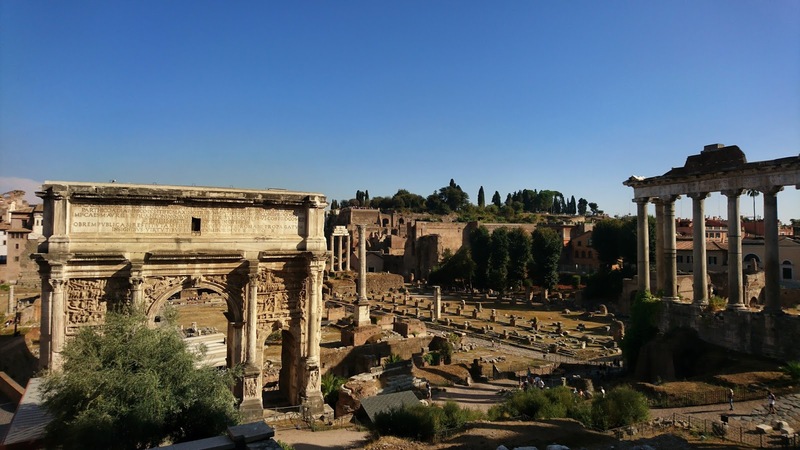 Hop-On Bus: If you visit Rome for the first time and like to access a lot of museums, i would recommend the Omnia City Pass, which also includes the tourist bus. Normally i always laugh about these tour busses, but on a hot day it is extremely nice to just get onto the Bus and enjoy the view from there. 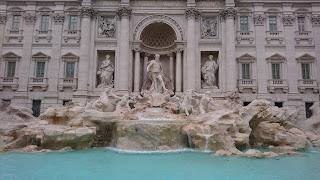 Fontana di Trevi: Well i guess you have heard of this one. The first time i visited this fountain was in the evening with a friend that i met/made in Rome. You will actually never find this spot empty, unless you come here at 6am, which i did the morning after. Even at that time, i was not alone. Traditionally you have to toss a coin into the fountain and make a wish. There are indeed specific rules, how to do it (with your right arm over your left shoulder, facing the fountain backwards). Yearly around 1,3million Euros are taken out of the fountain by staff, donated to a welfare organisation. 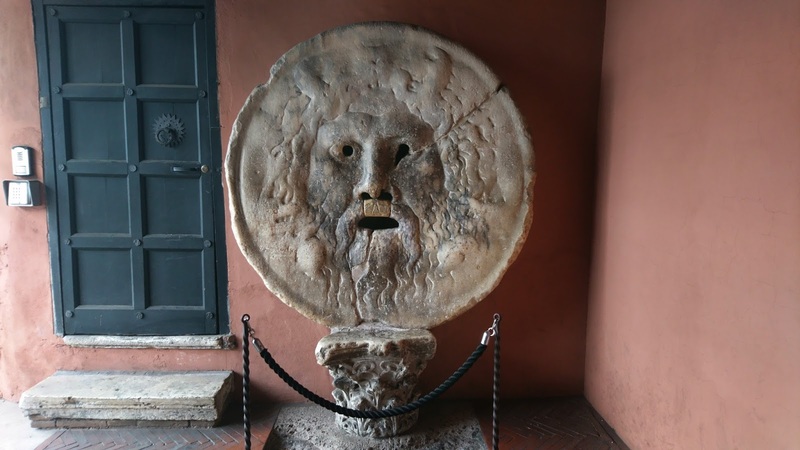 Bocca della Vérita: Mostly known from the movie "Roman Holidays" with Audrey Hephburn, this huge marmor plate is yet another very touristic attraction. It is hanging on the wall of the Basilica Santa Maria. The ancient believe is, that the mouth will shut around your hand, if you speak out a lie. Indeed it is a very exciting thing to do. To access this sight, you need to donate a small amount to the church. Spanish Steps: This set of steps between the Piazza di Spagna and Piazza Trinità dei Monti is a popular spot for many instagram bloggers and photoshoots. I went at 7am to see it empty, yet i was not the only one. 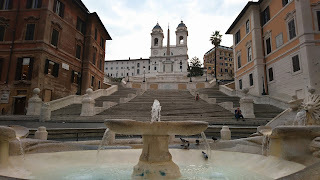 There is a fountain at the Base of the Stairs and another Church at the Top. This spot is as all the other tourist sights kept very clean and nice compared to the rest of the city. 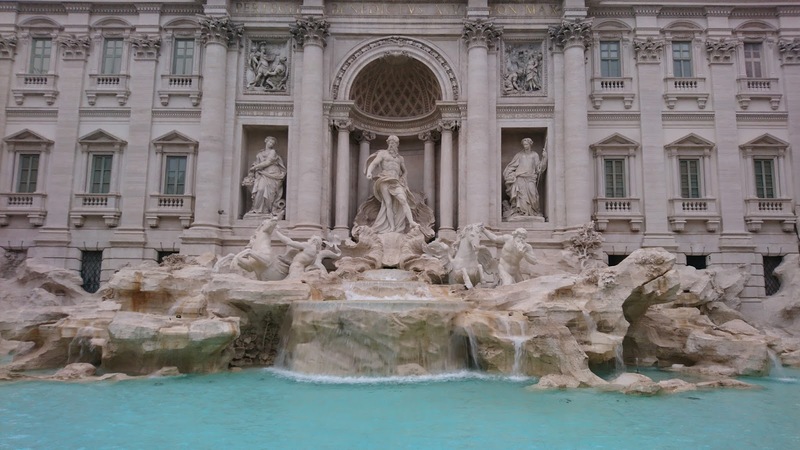 You can easily reach the steps from Fontana die Trevi, which will take you 10min walk. 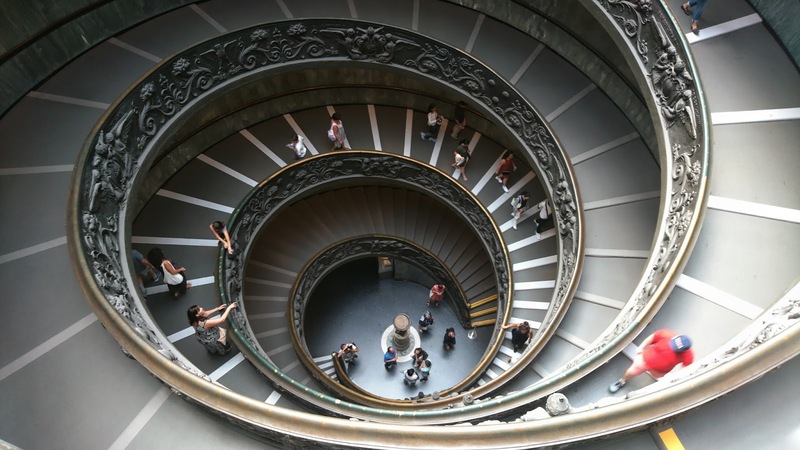 Vatican City: The state of Vatican is one of the busiest spots in the City and highly protected by military and police. If you like to visit, i would recommend you to buy a skip-the-line ticket with any operator. 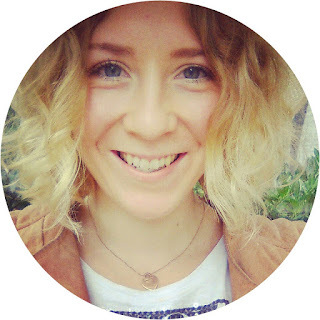 I booked a slot with Omnia before my visit, which saved me a lot of time. 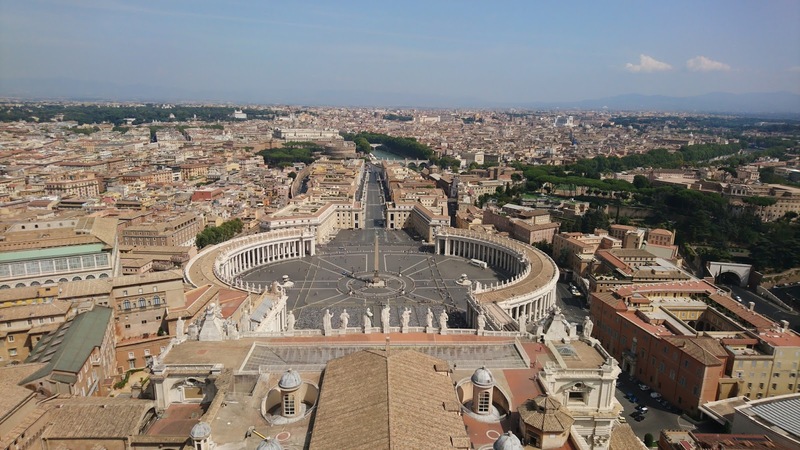 Otherwise you need to queue about 2h in the burning sun, to access the Basilica of St. Peter. The museums might not be as popular, and since they are huge, people flow in much faster. In the vatican museum there are so many statues, paintings, carpets and much more, you could probably spent at least half a day here. Nevertheless the biggest reason i went, was the Sistene Chapel. The painted ceiling and the last judgment fresco by Michelangelo, which covers the altar wall are breathtaking. It is not permitted to take any kind of picture or video material in this room, therefore you have to go yourself to see it. 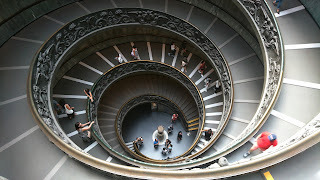 One more thing to do is climb the steps of the Basilica St. Peter. This is actually hard work and taking the elevator does not really make sense, since the hardest part to climb is the dome rooftop. In total it is 551steps you need to climb, you can skip 320 with the elevator. Being quite fit I still struggled, since it is really small alleys and you can get easily claustrophobic in the bad aired narrow towers. But after this torture, you will be rewarded with a fantastic view over the St. Peter Square and most of Rome. 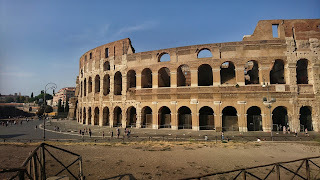 Colosseum: Also known as Flavian Amphitheatre, this oval historical site lies in the center of Rome. It's built of concrete and sand and the largest Amphitheatre ever built. 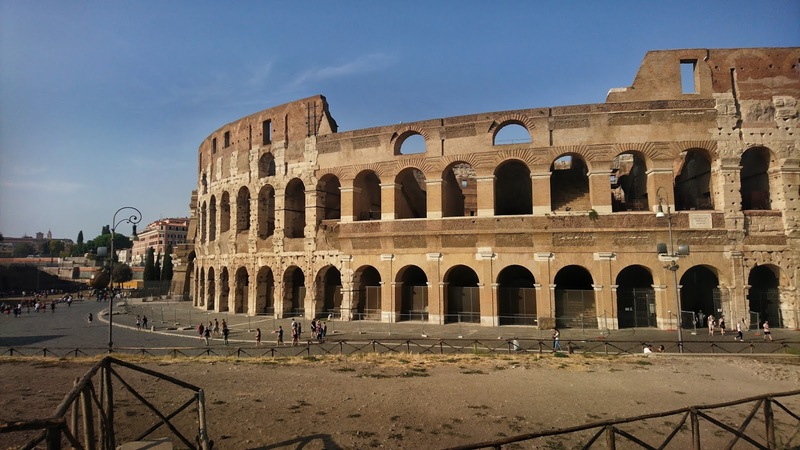 It could hold around 80.000 spectators for gladiatorial contests, animal fights and other public events. Nowadaways there is not much left and for me it was hard to imagine the ancient glory of this space. 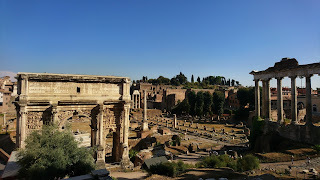 Forum Romanum: Directly next to the Colosseum you will see the Forum Romanum and Palantine Hill. According to roman mythology the cave, where Romulus and Remus, the founders of the City where kept alive by the she-wolf Lupa was located here. The total area is incredibly big, i did not go inside, but from around you can see most parts of the ancient ruins. 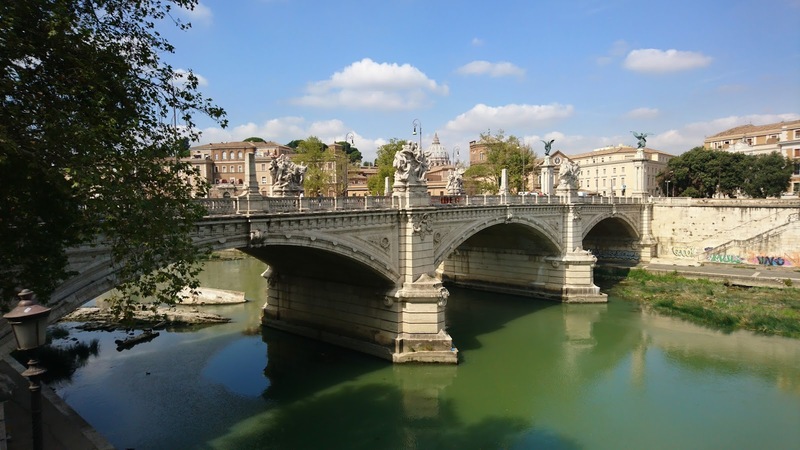 Other famous spots to see are the Panteon, the Trajan's Market, The Piazza Vittorio Emanuele II, Trastevere (mainly for food) and so many more. Flower Burger (vegan): I have been waiting 2 days and 2 nights to finally go to this Place. Located very close to Vatican, this place makes Burger dreams come true. 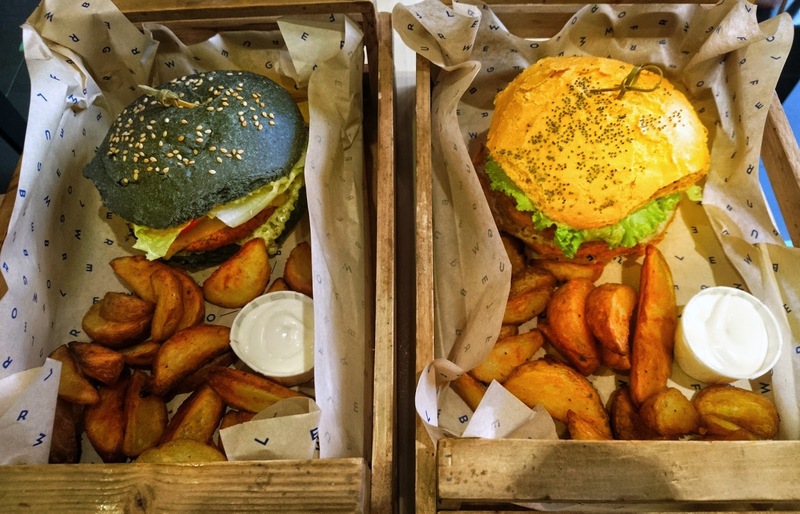 The variation of Burger Buns and patties is comparable to a rainbow. Sometimes they do special editions in pink and blue. While i was there, they offered an orange one. Even if you are not vegan, these burgers will more than satisfy you. My friend who is not a vegan is also still dreaming of her black charcoal burger. Écru (vegan): This place is also a raw/vegan café that offers a huge variation of breakfast and lunch. Furthermore they have many veganized italian desserts, like tiramisu. In the café they sell a lot of organic products as well, far cheaper than in sweden. I went twice, since i fell in love with the sandwiches they do. I really would love to know how they make this round bread, it's far beyond delicious. 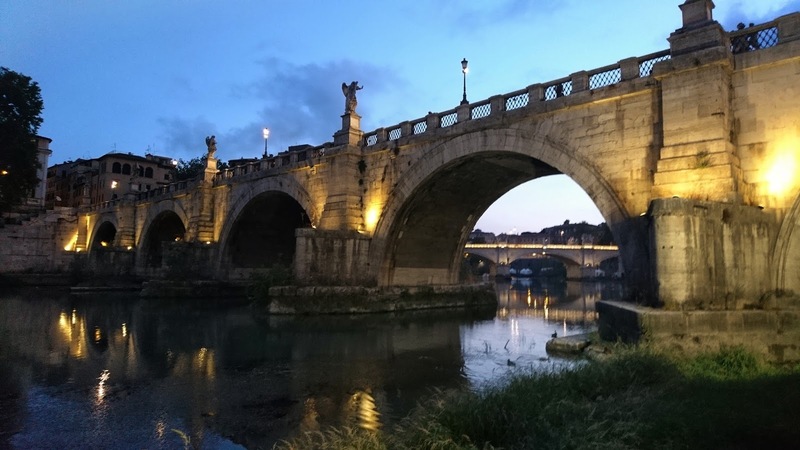 Dinner by the river: While my stay in rome, there were loads of tents built up on the river between Vatican and Trastevere, many offering like food trucks more individual treats and drinks. Me and my friend went to a place directly under Ponte Sant'Angelo, which was an incredible experience, since at night all the bridges are bathed in several spotlights. Gelateria Della Palma (Via della Maddalena 19/23): This place has 150 (!!!) different flavours of icecream. Usually if there is such a big offer, a lot of sorts are quite similiar, just have another name. Not in this case. 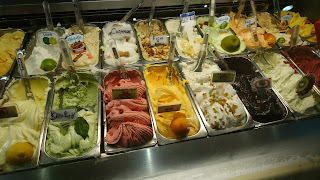 You can get any possible flavour in this icecream bar, weather fruit or candy, they got all of them. Furthermore they offer a broad range of Soy Icecream and most of the Fruit Sorts are without Milk. Most about different Seasons i like the change of fruit and vegetables. Especially autumn has so many nice veggies to offer, i can hardly choose between mushrooms, chestnuts, so many types of pumpkins and roots. To finally start into the most colourful season in Sweden, i decided to start with an easy Pumpkin soup, since i have not yet made so great experience with chestnuts. 1. 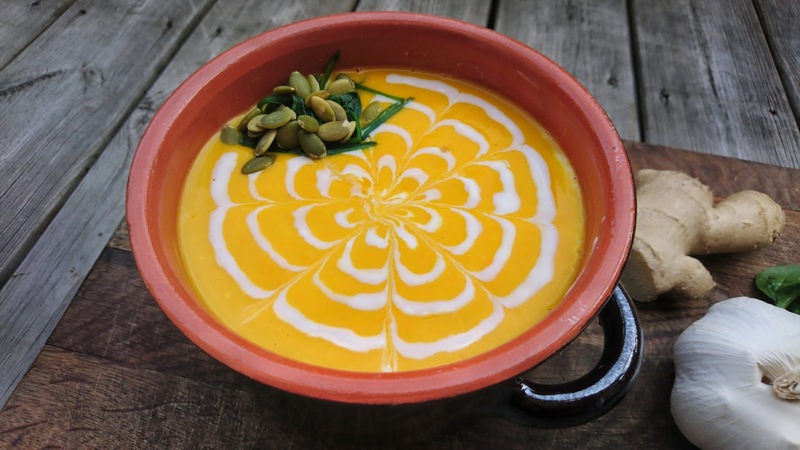 Wash your pumpkin and remove the top and bottom. 3. 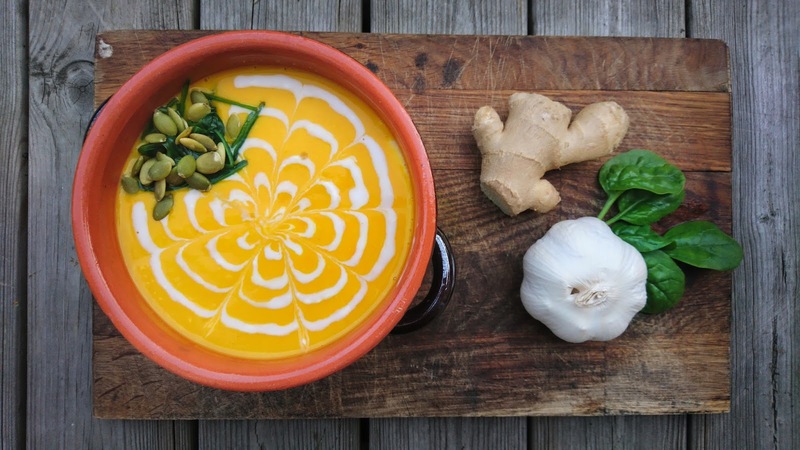 Add your pumpkin pieces andthe ginger with water and vegetable stew in a pot and cook until the pumpkin is soft and falls apart. Let cool down. 4. 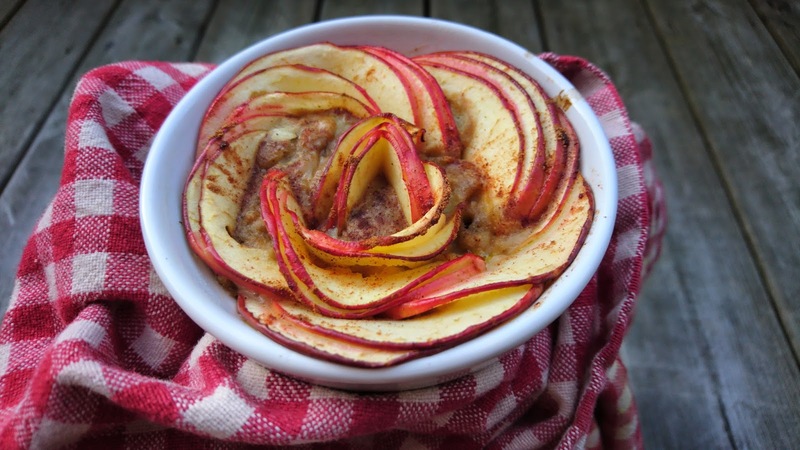 Use your handblender and blend all ingredients in the pot. Add on Coconut Milk and a pinch of Salt if neccessary. 5. Let the soup rest. It tastes best the next day, when all the ginger has settled.